[ABRAHAM LINCOLN]. Print. Abraham Lincoln. The Nations Martyr. Assassinated April 14th. 1865. Currier & Ives, New York, N.Y., 1865. 1 p., 13½ x 18 in. Light toning. By recycling stock images, Currier & Ives could issue “rush” prints of important 19th century events, thus providing Americans with graphic depictions of current events. 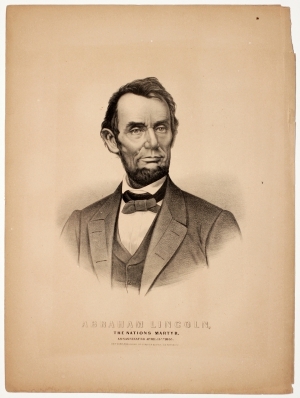 Based on Anthony Berger’s famed photograph taken in February 1864, this is a fine example of a “rush” print of Lincoln following his assassination to hang in the homes of Americans mourning the loss of their president.